Yes I just did another recipe recently for smashed potatoes; guilty as charged. As a matter of fact, it was because of that effort that I’m posting this one today. I realized that as much as I loved my chunky mix of mismatched ingredients, what I really look forward to are the leftovers that I can smash a bit more and fry up for breakfast or a delicious side dish for another meal. That use of leftovers never struck me as anything special until last week a friend asked me for the recipe and I had to admit I had never thought of it as a recipe. She did and so here we are today! 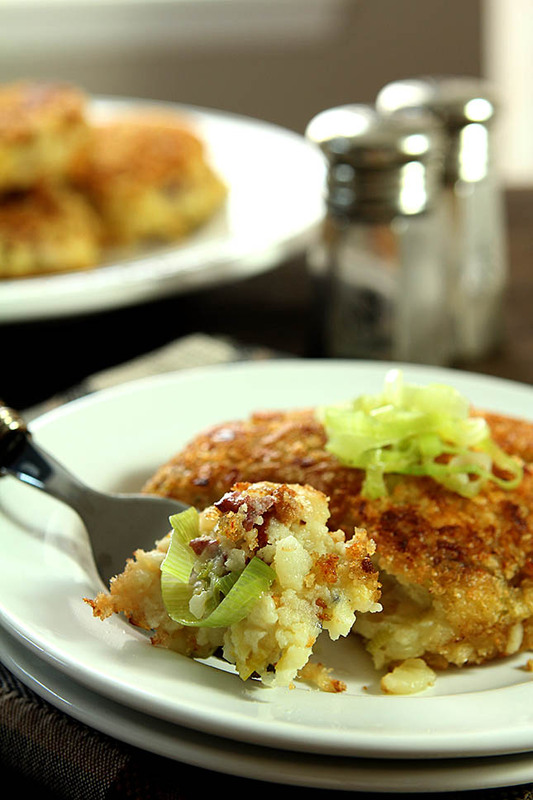 This same concept works equally well with ANY mashed potato but there is no doubt that these Leek, Bacon, Garlic and Thyme Smashed Potato Cakes might elevate the simple side just a bit more! How prophetic then that this weeks effort with the Food Network should have the theme of ‘Mashed?’ I immediately thought Smashed and after confirming that they did not expect me to over-imbibe (just kidding! ), I decided the time had come for me to share the simplicity of what I think is the ONLY way to eat leftover mashed potatoes. Granted someone did say, ‘What leftovers?’ because well, who doesn’t just love mashed potatoes but do what I do. Make too many, plan for leftovers, and trust me you won’t be disappointed. I’m recalling a time when the idea of mashed potatoes at all seemed like too much work so they weren’t on our table much when my kids were young. What brought them to light on our plate? Smashing. Maybe even more so was the wonderfulness of NOT PEELING THEM! Red potatoes probably helped too. Soft skin, pretty even in the end result and and all the elements were perfect for a side dish of this sort. Adding any number of combinations of ingredients to the mix makes them taste so good and each time I think I’ve hit the ‘best’ combination. That’s where I am today. Leeks? SO good. I love them so much and when I asked friends on Facebook ‘Love or Hate’ the answer was a resounding LOVE. The only issue? Cleaning the dirt/sand/grit out of them. I’ve made it so easy. I slice and separate them and then clean them. A couple of dunkings in a bowl of clean water and it’s really a 2 minute job. Which I love because I love them. Oops…did I say that already? Garlic? Duh (use enough to make it matter!). Bacon? Double Duh. Thyme? OK, maybe not a passion but on hand and it was the perfect accent. All together? So good that when I first made them I was happy having a portion for dinner. As in nothing else, just some potatoes. Hey, we had our meat group, veggies, dairy and a starch all in one bowl. 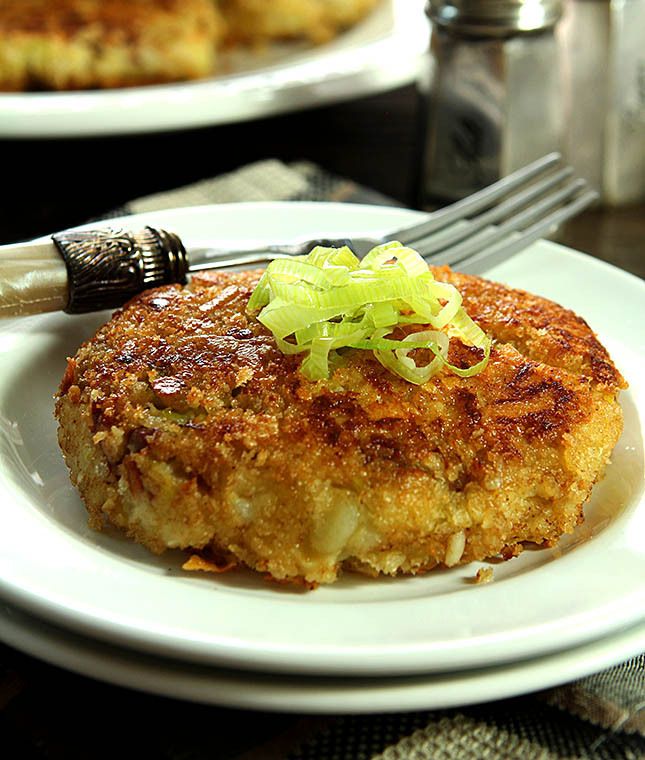 But I knew my ultimate goal was to make these absolutely amazing potato cakes. Take everything you love about mashed potatoes and put a crispy coating into the mix and well, you can start to get my drift right? It’s like this. If you were given the choice of a plate of boiled hash browns or a plate of crispy ones…which would you choose? Take my word for it…try these and you will be making extra too! Melt 3 tablespoons butter in heavy small skillet add leeks and saute over medium heat until limp but not browned. 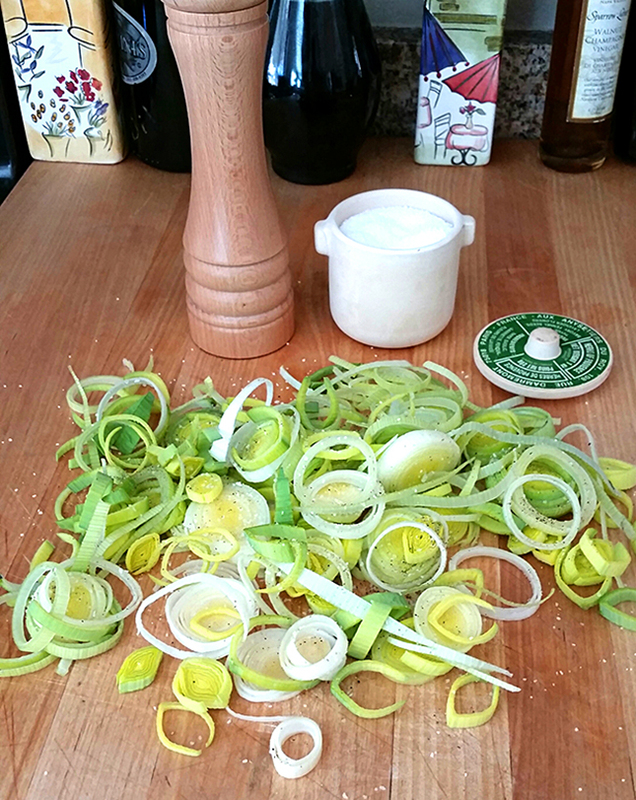 (Set aside a couple of spoonfuls of leeks for garnish if desired). Add garlic and sauté 1-2 minutes; do not brown. Take off heat and mix in bacon and thyme; cook for one minute; take off heat and set aside. Add leek, garlic and bacon mixture, half and half and remaining 3 tablespoons butter and sour cream and mash together. Season with salt and pepper. Mix the Panko crumbs and Parmesan and spread on a plate. Add the eggs to the smashed potatoes and mix thoroughly. Season with salt and pepper. Melt equal amount of butter and olive oil in the bottom of a skillet; measure out 1/2 cup of smashed potatoes for each cake and lightly smash in a disk. Fry over medium heat until warmed throughout and crispy on the outside. Garnish with a spoonful of leeks if desired and serve warm. Ooooooh potato cakes! And I love the garlic, leeks and bacon in them! I mean, what goes better with potatoes? And gorgeous gorgeous crusty outside… just perfect! Great side, fabulous lunch main! I don’t know whether I love you or not because I now have an obsession that MUST be dealt with soon. As in, I wish I had the ingredients in the house right now because I would be making them and I don’t care that it’s almost 10:00 at night! These look wonderful! Thanks for sharing the recipe. You are SO not good for my waistline…..